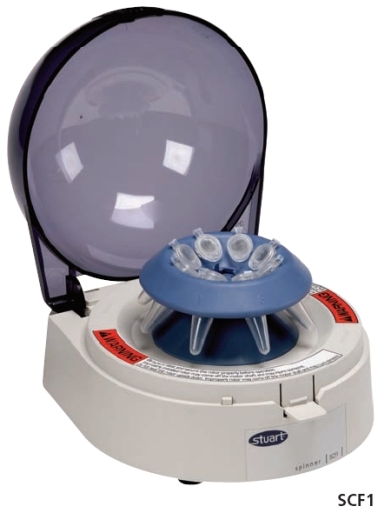 The SCF1 is a mini personal spinner for centrifugation of up to 8 x 1.5ml or 2.2ml microfuge tubes or two strips of 8 x 0.2ml tubes at speeds of up to 6,200rpm. The rotors (supplied) are easily installed without the use of tools. The SCF1 is very simple to use with the added advantages of a small footprint and quiet operation. The unit operates as soon as the lid is closed and automatically stops when it is opened. Alternatively it can be operated via a mains on / off switch.